March 30, 2012 by LindaJoy Rose . Posted in " Recipes, Sweets " . Tags " cashews, dessert, fruits, greek yogurt, healthy desserts, raw recipes, roasted fruit, vegan recipes, young coconut, young coconut shreds " . The aim of Raw Fusion Living is to find sophisticated yet simple ways of combining our foods so that they are visually appealing, nutritionally optimized and yet still have a decadent appeal. When we have something wonderful to look forward to as a snack, dessert or indulgence, we tend to stay more on track with healthier eating patterns. 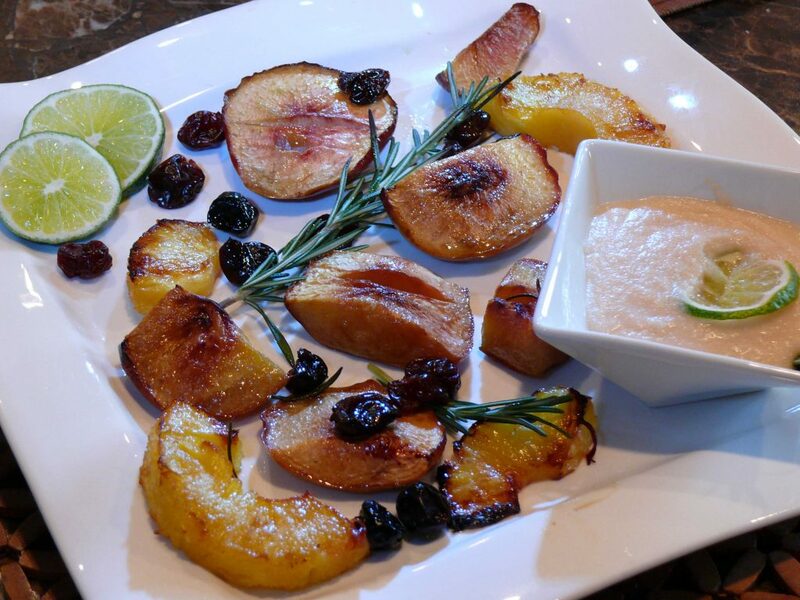 Roasted fruit is exotic and texturally interesting enough to make it an ideal Raw Fusion Dessert. You can use a wide variety of fruits, based on what you have on hand or in season. The stone fruits, like the nectarines I used, hold up to the heat well. There is something luxurious and almost perfume-like about the taste of slightly roasted pineapple Add the succulent scent and flavor of rosemary and you have a real taste sensation! The dipping sauce adds a lot of to this dish. You can make it as simple of whisking in some flavorings to Greek yogurt, to a more complex version made with tender young coconut flesh (pictured). Directions: Pre-heat oven to 425 degrees. Slice nectarines and discard pits. Cut pineapple rings in halves or pieces according to how much room you have on the baking dish or roasting pan. Brush dish with some coconut oil, lay the fruit out with rosemary sprigs in between. I’d recommend waiting to add the dried fruit until the other fruits start getting brown as it easily overcooks and gets crispy, and not in a tasty way! Brush the fruits with coconut oil and sprinkle sweetener on top. 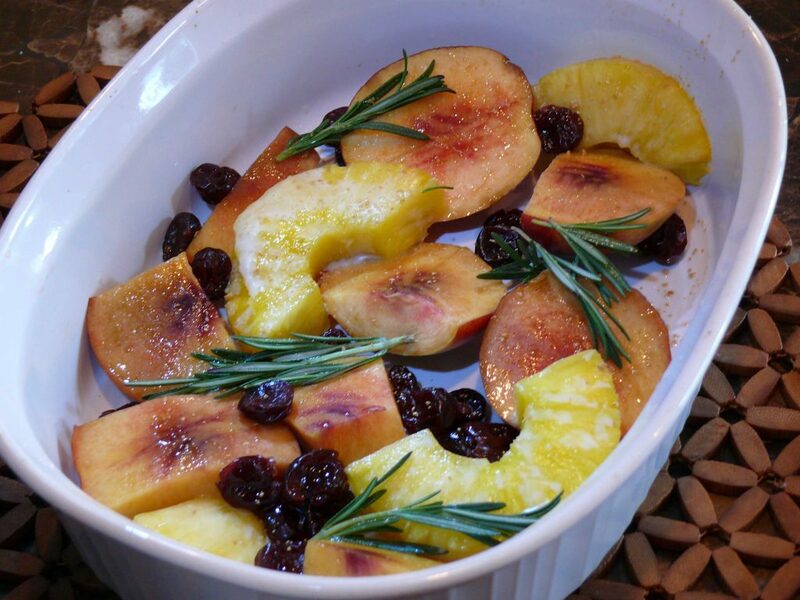 Place in oven for about 15 minutes – check to see if fruits are browning. Add cherries (or other dried fruit) Brush with more coconut oil if needed. Ready when lightly browned but still juicy! Mix 2/3 cup of greek-style yogurt with 2 TB. honey, coconut nectar or maple syrup and juice of one lime. Whisk until smooth. Garnish with lime slice. Soak 2/3 cup of raw cashews for 1-2 hours. Drain and rinse. Place in blender with 1/4 cup of water (to start and add more if needed) 1 TB. of virgin coconut oil, juice of one lime, and 2 TB. sweetener of your choice. Blend until smooth. Garnish with lime slice. Using either the flesh of one young coconut or defrost a bag of young coconut and drain/rinse thoroughly to remove as much of the sugar and preservatives used in packaging. (The latter is the convenience compromise, raw fusion method! ) Blend with 1 TB. coconut butter (you can replace with 1.5 TB. coconut oil) juice from one lime, 2 TB. of sweetener of your choice and 1 TB. of shredded dried coconut. Garnish with lime.